posted: January 30, 2018 by: Caroline Oliver Tags: "Clinic Specials" "News"
If you canine companion or feline friend has red gums, yellow teeth and stinky breath, it could be a sign of serious oral disease that could, if left untreated, lead to devastating affects on your pet's quality of life. 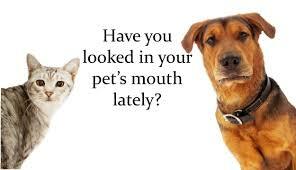 At Higley Road Pet Clinic we feel your pets dental health is extremely important therefore we are offering a 10% discount toward dental cleaning services for the entire month of February! Please contact is today for more information!